As many of you know I suffered a fractured heel bone at the end of May and have been recovering ever since. I’m still in physical therapy and realize an older body takes longer to heal. I want to thank you for your continued support, well wishes and help during this time. You have been patient in picking up your pets and putting them on the exam table for me, allowing me to sit down to do exams and waiting a little extra time for me to get medications, etc. Your help has been instrumental in my rehabilitation. Likewise I would like to thank my wonderful, hard-working staff who have had to work even harder during this time. Their efforts have allowed me to continue working. Cassie, Christy, Julie, Donna, Laura, Nicki, Jody and Theresa are the best staff I have ever worked with. Dr. Zabel, my boss, has been especially helpful allowing me to work reduced hours and dealing with many schedule changes. We now welcome aboard our new third veterinarian Dr. Jebens and new staff member Jody. Dr. Jebens is a University of Illinois College of Veterinary Medicine graduate with many years of experience in small animal medicine. I’m sure you’ll enjoy working with her. The study by Dr. Avery at the veterinary school, Colorado State University is still going on. Several of you have helped with blood samples from your dogs and I appreciate your participation. We can still use samples — dogs must be 2 years old or older with no major illness. Dogs who have had FSF episodes and also those who have never had an episode are needed. 20-25 mls of blood is taken for the study. The focus is to try to identify proteins in the blood of FSF dogs that are not in the blood of normal Shar-Pei and use this as a screening test to find carriers for FSF and remove them from breeding programs. Rarely, soft wraps on the wrists are used initially to provide additional support while the above changes are being implemented. Ace™ bandages with or without PVC splints are useful and can be changed and washed as needed. Usually the front legs will straighten up in 7-14 days. Pups that don’t respond or in older pups X-rays should be taken to further evaluate for orthopedic problems such as premature closure of growth plates, bone cysts, and other problems. 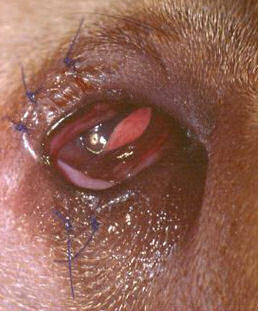 “Cherry eye” is properly called PROLAPSE OF THE GLAND OF THE THIRD EYELID. Dogs have a third eyelid in the inner corner of the eye nearest the nose. It serves as a “windshield wiper” distributing the tear film over the eye. It also contains a tear-producing gland which accounts for about 50% of the tear production in the eye. 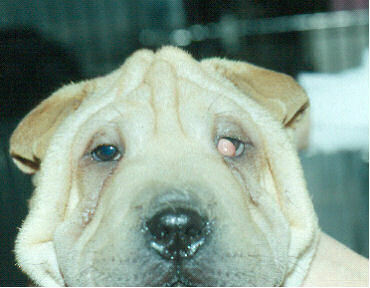 In young Shar-Pei puppies, this gland will occasionally break loose from its attachment in the third eyelid and “pop” up and appear as a swelling in the corner of the eye. It often will appear red and inflamed, although it doesn’t seem to bother the dog too much. This condition must be surgically corrected using a “tacking” procedure which re-attaches the gland to its position in the third eyelid. Another less technically demanding procedure is call the “pocket technique”. While it is not a difficult surgery there is about a 10-20% recurrence rate and the surgery has to be repeated. Some veterinarians advise removal of the gland, but this could result in decreased tear production later on and a condition known as “dry eye” or KCS. Tacking should be tried first. 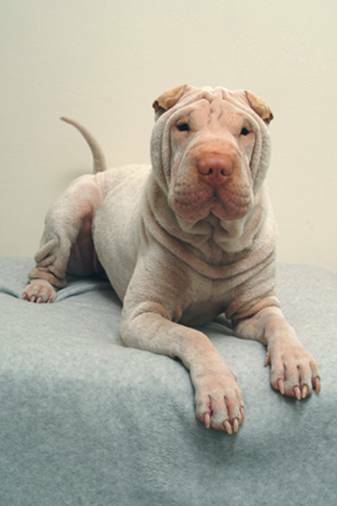 In the Shar-Pei, entropion may be a complicating factor in cherry eye in that the eyelashes rub on the third eyelid and may cause irritation resulting in prolapse of the gland. The eyelids may be tacked along with the cherry eye correction. Anti-inflammatory drug therapy is a major cause. This occurs because these drugs directly decrease hyaluronan production. Drugs known to cause deflated muzzles include: NSAIDs – such as aspirin, carprofen (Rimadyl™), ketoprofen (Ketofen™), etodolac (Etogesic™), acetaminophen (Tylenol™), deracoxib (Deramaxx™), tepoxalin (Zubrin™), firocoxib (Previcox™), Piroxicam (Feldene™), meloxicam (Metacam™) and others. Steroids – prednisolone, prednisone, dexamethasone, others. Antihistamines – chlorpheniramine, diphenhydramine (Benadryl®), others. Stress – the release of substances related to stress will also deflate the muzzle. Stress should not always be thought of in terms negative things but any change in the dog’s normal routine can be thought of as stress. Positive stresses may consist of over activity, heat cycles, new people in the household, etc. 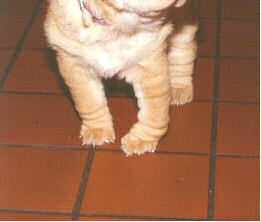 Illness — This is the most important cause of deflated muzzle and one that Shar-Pei owners need to be very aware of. Think of the muzzle in this breed as the pop-up timer on the Thanksgiving turkey. When the muzzle deflates something is wrong and you should see your veterinarian quickly. FSF is a common cause of deflated muzzle as is kidney failure. 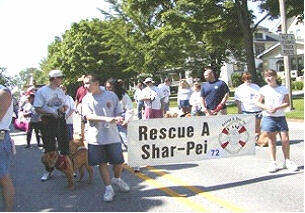 RASP at the LaGrange Pet Parade this year.